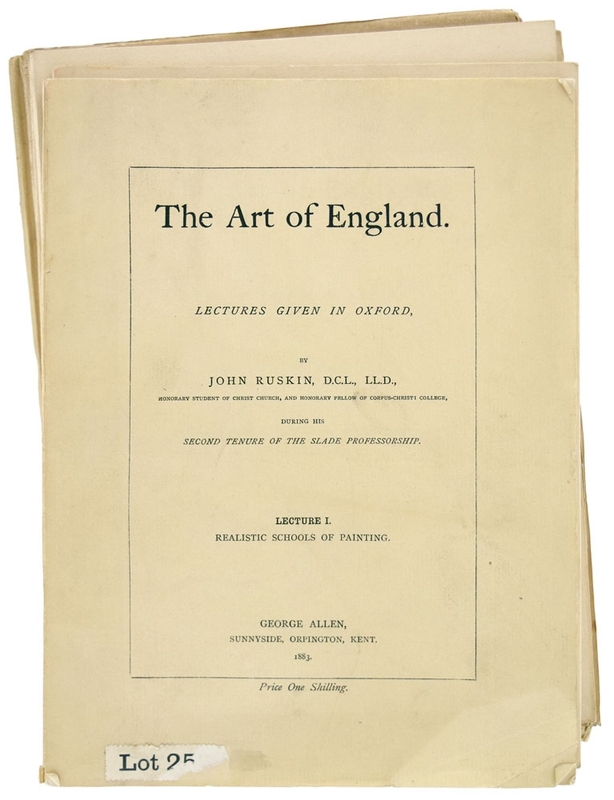 The Art of England. Lectures given in Oxford, 1883-84, 7 parts, pp. [iv], 35, ; [ii], [37-] 72; [73-] 113, ; [115-] 157, ; [ii], [159-] 197, ; slip (Publisher's Notice), [ii], [199-] 241, ; [viii], [243-] 292, 3 numbers with the ticket of G.G. Walmsley, Bookseller, Liverpool, remains of a Lot number on upper cover of Lecture I. The last number, Appendix and Index, a little taller than the rest. The Storm Clouds of the Nineteenth Century. Two Lectures delivered at the London Institution, 1884, 2 parts, pp. [viii], 63, ; [iv], [65-] 152, [2, general title and Contents], second Lecture unopened. In montibus sanctis. Studies of Mountain Form and of its visible Causes. 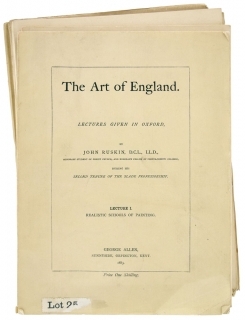 Collected and Completed out of "Modern Painters", 1844-85, 2 part, .loosely inserted announcement of "The Pleasure of England", pp. [viii], 40; [ii], [41-] 85. Ticket of G.G. Walmsley, Bookseller, Liverpool, on both. The Pleasures of England. Lectures given in Oxford, 1884-85, 4 parts, pp. [ii], 36; [37-] 80; [ii], [81-], 121, ; [ii], [123-] 160, . Traced of Lot No. on upper cover of I. '1883 was spent mainly at Brantwood, where Ruskin was visited by Mr and Mrs La Touche, except for excursions to London, to Scotland in September, and to Oxford in March, May, and November to deliver the lectures published as The Art of England (1884). In restrained tones, Ruskin reviewed the work of the artists he had known, and praised a group of contemporary women illustrative artists. But he was unwell by the end of the year, and the state of his mind was revealed in the late tour de force, The Storm Cloud of the Nineteenth Century (1884), based on a lecture given twice at the London Institution in February of that year. It was an extraordinary collision between the public and the personal. Following fifty years of amateur meteorological observation, he stated that since 1871 a new 'plague-wind' (Works, 34.31) had begun to blow which had darkened the skies and, by implication, the mind of man. He found a moral metaphor in the foul winds recorded in his diaries which had an objective correlative in industrial pollution, but which was also a figure for his own mind. In the printed version, the second lecture is an annotation of and private commentary on the first ... His Michaelmas lectures, titled 'The pleasures of England', were largely extempore disquisitions on the English character which gave free rein to his anger and disappointment, and became a spectacle for the undergraduates. He was forcibly dissuaded by the vice-chancellor, Benjamin Jowett, from giving two announced lectures on science and atheism' (ODNB).